Cuba’s streets are literally lined with signs of change. ‘For sale’ placards sit in windows of cars and homes, now considered private property. New family-run cafes stand beside old state-operated cafeterias. Cuban Americans and tourists exchange ideas and goods with locals. Government billboards proclaim: ‘The reforms in Cuba are for more socialism.’ People are overwhelmed, excited, uncertain. Against the backdrop of such upheaval, a smaller but significant change has nearly gone unnoticed: the legalization of car racing. The Cuban Revolution has always had a contentious relationship with racing. In the 1958 Cuban Grand Prix, rebels kidnapped Argentine racing legend Fangio in order to publicize their cause. During that same race, an accident killed seven spectators. As a result of these incidents and the 1959 Revolution, car racing came to be viewed as a dangerous and elitist sport in Cuba. In 1962, the sport was banned entirely. 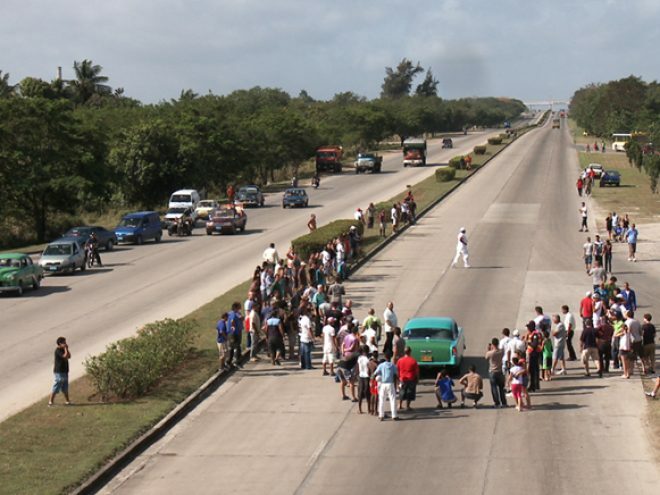 Nevertheless, clandestine drag racing has thrived, and last year the Cuban people, energized by all the recent reforms, successfully pressured the government to legalize car racing again. HAVANA MOTOR CLUB follows five of Cuba’s top racers as they struggle to prepare their classic American cars for the first official race since the Revolution. One racer enlists the help of a Cuban American patron in Miami to smuggle in parts for his illegal Porsche. His main competitor is a renowned mechanic who uses ingenuity rather than resources to create a racing monster. Another racer ponders whether he will participate in the race or sell his mammoth motor—one that he recovered on the ocean floor from a sunken ship used to smuggle Cubans off the island—in order to flee Cuba on a raft headed to Florida. Three days before the contest, just as excitement has reached a fever pitch, the Pope announces his visit to Cuba, and the government cancels the race. The racers are furious, and in defiance, they hold their own illegal contest. However, with a lousy track and no judges present, they argue and almost come to blows, refusing to acknowledge a winner. The only thing that will appease them now is an official race. After many other suspensions, it is announced that the historic race will finally take place in January 2013, almost a year after the original date. The racers view the announcement with guarded optimism. Will the race actually happen this time? And if so, at what cost? Eduardo is the hothead of the group, always provoking fights among the other racers. He’s obsessed with winning and consumed by not having the same access to outside resources that others have. What he can’t buy, he makes, and his ‘56 Chevrolet, “The Missile of El Cerro,” contains many secrets. I first started working in Cuba five years ago in order to develop a narrative film, for which I received a Sundance Institute/Sloan Foundation grant to write and direct. While working on the script in Havana, I was asked by a Russian director to do a “making-of” documentary about his own experience making a film in Cuba. While I was shooting that film, I went to a car event where they announced the first official car race in Cuba in over fifty years. My crew and I decided to follow the racers who were preparing for this historic event, which was supposed to be held six weeks after the announcement. The race kept on getting postponed and ended up taking over a year to organize. During these postponements, I really got to know my characters and their communities. We shot over 300 hours of footage with them in order to capture not only their vibrant drag racing culture, but also how Cuba is changing today. This five-year process that spanned three unrelated film projects allowed me to get to know Havana in an intimate manner that we feel is reflected in HAVANA MOTOR CLUB.